Well, I couldn't be expected to subsist solely on pita bread this past week, now could I? (I really did try, though). But my favorite sweet peppers in the garden have finally turned red, and so I decided it was time for some soup. This is one of the easiest soups you will ever make. I went from unwashed garden bounty to sample spoonfuls in less than 40 minutes. The combination of yellow squash and sweet red peppers gives it a unique flavor and gorgeous color. The key, of course, is using the best ingredients you can find. Homemade chicken stock really does make a difference (in almost any recipe), and I always try to keep at least a few quarts of it in the freezer. It comes in very handy for impromptu soup making sessions. You can vary the amounts of vegetables called for to suit your taste; more will give you a slightly thicker soup. You could use orange peppers instead of red if you happen to have some handy. My orange bells in the garden are so sweet and so few, I always end up cutting them into strips and just eating them raw or tossing them into salads. This soup is also a good way to disguise vegetables from picky eaters. Because it is pureed, even ardent little squash haters would be hard pressed to correctly identify the offending ingredient. It's healthy and light and yet heavy with the deep flavors of summer. It's delicious hot, cold, and at room temperature. It makes a delightful first course, or a perfect light supper when served with a simple garden salad and a hunk of warm crusty bread. You can dress it up with a few fresh chives and a dollop of sour cream. You can toss in a few very ripe, chopped tomatoes when it is cold, and you can swirl in some nice pesto and instantly give it a completely different character when it is hot. Or you can just stand over the stove and eat it straight from the pot, slurping it up with your big wooden stirring spoon. All in the name of recipe development, of course. As with so many soups, this one tastes even better after sitting for a day or two in the fridge, if you can make it last that long. Not in the mood for soup just yet? Pour it into plastic containers and freeze it until many months from now when all you are craving is a tasty dose of sunshine. Add the chicken stock and bring to a boil. Reduce heat and simmer with the lid cracked, stirring occasionally, until the vegetables are very soft, about 15 to 20 minutes. Using a counter top blender or immersion blender (I love my KitchenAid hand blender), carefully puree the soup to desired consistency. Salt and pepper to taste, and serve hot or cold, garnished if desired. *Check out my post, The Pita Project, to learn how easy it is to make your own delicious pita bread. **Note: You can skip this step, and your soup will still taste wonderful. Just toss all the ingredients into the pot (without the olive oil), bring to a boil, and follow the rest of the instructions. © FarmgirlFare.com, the soup slurping foodie farm blog where Farmgirl Susan shares recipes, stories, and photos from her crazy country life on 240 remote Missouri acres. What beautiful peppers. 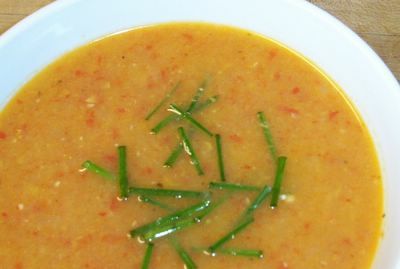 The soup looks great... do you think it would work with vegetable broth? This soup looks delicious and I love your photos! Thanks for the recipe and all the tips! This looks beautiful! The flavour would be as vibrant as the taste with your home grown veggies! Oh, I love vegetable-based soups. I'll have to share my mom's chicken soup with pureed veggie broth when the weather turns. This looks wonderful! I bought a bag of red peppers yesterday but we ate most of them last night in our stir fry. The soup sounds delish. I absolutely love big red peppers. The way they feel in your hands! Almost like they aren't food but some kind of little sculptures or art or something, all smooth and glossy and sturdy. I was actually thinking about you when I made this soup and wrote the post. I considered mentioning that vegetable broth would work in place of the chicken broth, but I was hesitant to since I haven't actually tried it. I bet if you had a nice, flavorful stock it would be just fine. Also, something else I thought of was that it might be nice with roasted red peppers. 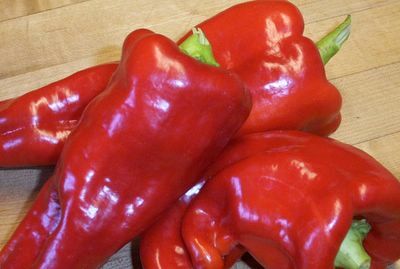 You could either roast the fresh ones over a gas flame on the stovetop or in the oven--or possibly even toss in a jar of roasted peppers instead. A combination of roasted and unroasted might be good. I think that if there was any lack of flavor without the chicken stock, the roasted peppers would definitely give the soup some kick. Let me know if you try making it and how it comes out. Why thank you. Considering how simple the recipe is, it does have a lot of flavor. And I just love the color. It's definitely summer in a bowl! There's nothing like homemade soup, is there? Can't wait for your recipe. Let me know if you try this one and how you like it. A red pepper lover with a freezer full of homemade stock--I knew you had fabulous taste! : ) Looking forward to reading your pepper posts on The Flying Apple. I just missed your comment. Mmmm, red peppers in stir-fry sounds delish, too. Actually, pretty much red pepper anything sounds delish to me! Hi Susan. The soup looks great - such a gorgeous color! Susan: I think I can see the sky in those red peppers! Not to tinker with your fine recipe (squash in there! great idea), but Fran McCullough -- I love her recipes -- makes a roasted red pepper soup with Moroccan flavors. Warm and sinful. I don't know where you find the time for everything you do. I looove red pepper soup - though I've never added squash to it. I have to admit, I don't think I like squash, but maybe as you said, using the blender might hide it nicely. Nice post - it's a pretty color! that sure looks delicious and healthy - your idea about adding roasted red peppers sounds good, I will definitely be trying this - thanks for the recipe! This soup is wonderful! I made it last night using Imagine brand vegetable stock, and just finished devouring some for lunch. It was a bowl of sunshine on an otherwise dreary day in the ol' cubicle. Thanks! I am so glad I found your blog! This soup looks fantastic. I assume that freezing it would be ok. I am vegetarian and am always looking for fabulous recipes. Thanks again! Oh, tinker away with my recipe. That's what is nice about it--so many possibilities. Thanks so much for sharing my soup recipe. Wow, you aren't kidding when you say, "Every single day, a vegetable in a new way" over at A Veggie Venture. What a delicious site! You never know--this soup just might turn you into a squash lover. Always nice to hear from you. I made this soup again yesterday and used half a 16 ounce jar of roasted red peppers in place of some of the fresh ones. I didn't taste a huge flavor difference, but I had also been eating the last batch with homemade pesto stirred in (talk about yum). And I didn't try any of the peppers straight from the jar--they might not have had a very strong roasted flavor. I'm sure the best thing would be to roast fresh peppers, though that would definitely add some extra time to the preparation. It would probably be worth it, though. If anyone tries this, I'd love to hear about it. Welcome to the farm! I'm so glad you found us, too. As you probably read above, Emily made the soup with vegetable broth and pronounced it a winner. As far as freezing it, I froze some of the batch I made yesterday in a plastic 3-cup (24-ounce) freezer container (one way to keep me from eating it all!). I haven't frozen it before, but I assume it will be fine. Most soups seem to freeze well. Thanks for taking the time to say hello. I look forward to hearing from you again. I was looking for a nice cold soup recipe and will try your this weekend ... Thanks! That looks and sounds divine. It's that time, isn't it? I just put up a recipe for a soup involving butternut squash and red peppers. Man was that good. And I've added you to my blogroll. This is the first recipe I've made myself after trying the swiss chard and artichoke dip my step-mom made. The dip was delish and so was this. Can't wait to try more recipes! btw, you were the tipping point for me to buy an immersion blender. Thanks for the great recipes! I made this soup today and I have to say I was impressed! I didn't like the smell while it was cooking and I was worried I wouldn't like it, but as soon as I tasted it, I was won over 1000%. Delicious soup.